Dial a saturated, but not overloaded. The hours and minutes are displayed on the main dial with hour markers overhead, duplicated fluorescent dots. Hour and minute hands are also covered with fluorescent compound. The second hand on a separate dial with numerical markings (at around “6:00”). In the top left of the dial located: aperture day and complication “big date” (bordered). Front and back sapphire crystal watch reserved. The model is set manufactory caliber CFB A1011 at 33 stones with a carrying frequency of 28.800 vibrations per hour, and power reserve of 55 hours. Hours are in a round steel case diameter 42.5 mm and 12.5 mm. Water Resistant – 100 meters. The watch comes on a brown alligator strap or steel bracelet. In the women’s collection as well Alacria replenishment: Model Diva Bamboo. In China, bamboo is a symbol of longevity, while in India – a symbol of friendship. In the Philippines, bamboo is associated with good fortune, and in Japan – with cleanliness. 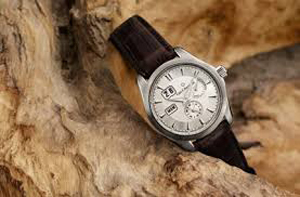 Designers Carl F. Bucherer decided that their clients should be associated with bamboo exotic wristwatch. They dial in white gold entirely encrusted with precious stones baguette-cut diamonds. The combination of orange and 83 black sapphires resembles stalks of bamboo. Case is also made of white gold and dotted with orange sapphires and 90 black baguette-cut diamonds and 239 round black sapphires. The crown is also decorated with orange sapphire. The watch comes on an orange leather strap Louisiana alligator with white gold clasp. Exclusive series is limited to only 25 copies. Dial each model has its own unique design gems.